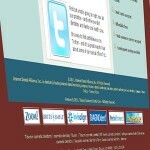 Dental Website Footers – Your website comes complete with standard footer content including navigation, copyright, etc. You can also add an optional footer line to any page on this dental website. Some states may require specific language for certain dental markets, for example, or you may want to provide other information or links. It’s up to you. In the “Page Footers” area of the “Customize Portals” section, you can add customized footers to your website pages. You can also add custom footers to any page on your website. You might want to provide extra information, add HTML links, or your state might require you to include specific language for certain dental markets. Whatever it is, you can control here. You’ll see a list of all the pages on your website. Just click in the cell next to any page to customize its footer text. When you click out of that cell, your information is automatically saved. For example, if we add a custom footer to the “Dental Info Center” page, we can go to the live website and see that footer instantly updated. Remember, IDA automatically adds navigation and other footers to your website. The “Page Footers” area is where you can add any custom footer information to your website.